I bet you're enjoying 'Heroes' on the telly at the moment? No? Oh, please yourselves. 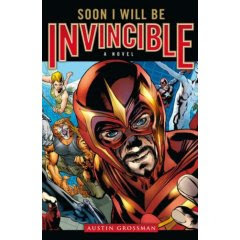 If you are then you might be interested in Austin Grossman's novel 'Soon I Will Be Invincible'. Imagine 'Heroes' but done slightly differently. This is 'Heroes' where all the super heroes and villains DO wear outlandish costumes but, taking a leaf from Alan Moore's 'Watchmen', they're all deeply insecure, cynical, arrogant, dysfunctional and often downright unappealing. Oh, the life of a super-hero or super-villain...not always a bed of roses is what Grossman's line seems to be. The best thing about the book is that it's done with tongue very firmly in cheek. The story centres on cyber super heroine Fatale signing up to join the Champions, a group of infuriatingly pompous super beings suffering from the demise of their leader CoreFire, in a bid to help them quash the machinations of uber-villain Doctor Impossible who is plotting, once more, to take over the world. The story is told from the first person point of view of both Fatale and Impossible. So you get the main narrative but with both characters taking you back and forth into their respective histories and the super-hero dominated universe in which they exist. And it is set on a familiar Earth but one that has had to come to terms with the existence of these strange meta-humans. And naturally, society has turned them all into celebrities - super heroes and villains cast as re-hab Britney or drink-drive Keifer. The prose is spare and economical, mainly navel-gazing internal monologues from Impossible and Fatale but often Grossman's descriptive powers really kick in and the chapter where the Champions break into Impossible's derelict island base or the piece where they fight him on a Manhattan street are both evocative and pacy and encourages you to turn the pages and find out what happens next to our hapless bunch. There are probably lots of in-jokes to certain comic books and characters that will please the geeks but don't let that put you off. I'm no expert and I still found much of the satire and wit directed at the tropes of super-heroes painfully funny and frighteningly accurate. And the chapter headings sum up this attitude to the genre with a litany of cliches from the world of these heroes and villains that will be so very familiar even to the casual reader. Ultimately, I don't think there is any one character that is totally likeable. One tends to feel sorry for most of them as they seem so crippled by their inability to cope with their various meta-human states and powers, their all too human emotions, and ensuring their spandex costumes and tights don't end up in tatters. Impossible's obsession with cunning plans and the use of technology to gain mastery over all is really just him screaming out to be loved I'm sure.